This is the first installment in Crazie Talk’s Official Recruiting Guide. First up, we’ll take a look at the two highly-touted McDonald’s All-Americans that comprise Duke’s incoming Class of 2013. Ryan is an extremely gifted basketball player. He is a classic European-type forward with great touch and guard-like ball-handling skills. At 6’10”, Ryan was the winner of the McDonald’s All-American Three-Point Shooting contest, and his size and range will create significant matchup problems for opposing big men in the ACC. His ability to stretch defenses with the jump shot will truly pay dividends this year – especially in the wake of Gerald Henderson’s and Greg Paulus’ departures. Kelly’s work ethic and attitude fit the Duke fashion; he is a proven winner and dedicated competitor. Look for Kelly to play a role similar to that of Mike Dunleavy on the 2001 Championship team. It will be no surprise if Ryan contributes in a big way next season. Mason loves to dunk on everybody. And he can. [sidenote: Jake has been dunked on by both Plumlee brothers in high school, but Mason pulled out a reverse.] 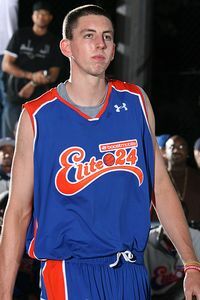 At 6’11” and equipped with an enormous wingspan, Plumlee, the younger brother of current Devil Miles, is a gifted athlete. He is a true post player with excellent rebounding skills, but can also shoot from 15-feet, run the floor, and handle the ball very well. Because of his tendency to play on the block, Mason could possibly be an exception to the rule and work his way into the starting lineup this season. Plumlee has uncommon work ethic and natural leadership ability. These traits, in addition to his overall basketball acuity, will make Mason an integral component of Duke’s success in the next four years. Next week: A look at the verbal commitments in the high school Class of 2010! Every Monday morning, Crazie Talk culls Duke basketball news, articles, and videos into a half dozen of the best “Deviled Eggs” on the interwebs. Coach K's first press conference at Duke; It certainly wasn't his last. Coach K makes it very clear that he’s not interested in the Lakers’ not-so-vacant coaching position. Jon Scheyer is working hard this summer preparing himself for the challenge of the coming season. We’ll need everything he’s got. Harrison Barnes is the top prep recruit in the country, and our number one target for 2010. He’s also a fan of Beethoven. Will a franchise riddled with Tar Heels accept G into their midst? Hopefully, for their pitiful record’s sake. He may be a long shot to play at Duke, but 2010 PG Joe Jackson does a nice Nate Robinson impression here. Check back this week for a Crazie Talk recruiting guide for the Class of 2010! A Season on the Brink? For Duke fans, happiness has been a transient emotion for several months. The joys of an ACC title and return to the Sweet 16 were spoiled by a painful defeat to a hungry Villanova squad. In spite of a fervent campaign to keep him for a fourth year, Gerald Henderson entered the NBA draft. The recruitment of star point guard John Wall ended in bitterness when the future lottery pick signed with the Kentucky Wildcats. Most recently, due to tragic and unforeseen circumstances, Elliot Williams – the program’s most promising underclassman – transferred to the University of Memphis to be closer to his family. Ironically, none of these events are mystifying—each loss and disappointment has a valid explanation. The only appropriate reaction is a sigh of disbelief and a look towards the coming season. Nonetheless, many Blue Devils have already started looking ahead to 2010-11, while writing the upcoming season off as the product of a series of unfortunate events. Gone are the days when Nolan deferred to Greg on the perimeter, or looked towards a streaking Henderson on the fast break. Nolan, who has been playing in a summer league in his native D.C., will have to be a more prolific scorer. Jon has shown the ability to play point guard, and will be called upon even more this season to conduct the offense. However, neither guard will be challenged as much as Kyle Singler. The brilliant junior’s versatile game will be stretched next year. He will be asked to defend quicker guards—he showed that ability shutting down a red-hot Jimmy Baron in last season’s nail-biter against Rhode Island. His improved perimeter jumper will be needed more than in his first two seasons. However, Kyle will have to adapt to being the focal point of the opponent’s defense every night. He is the one recognized star on next year’s team, and his skills, toughness, and leadership will help determine how far this team goes. Zone defense. It has been taboo in Cameron during K’s tenure, but a lack of perimeter quickness means that a zone may be the only option. Slow the pace. We have a much, much better chance at winning games playing in the half-court instead of trying to keep up with quicker teams. We will win more games in the 60s and 70s than in the 80s and above. Ryan Kelly must deliver. Ryan won the McDonald’s All-American 3-point shooting contest, and will have to shoot well while using his length and deceptive quickness around the basket. Lance Thomas and Brian Zoubek have to be the post’s anchor. As seniors, it’s up to Lance and Z to direct traffic and teach the younger guys their roles in the offense. Their numbers improved last season, but they will have to score and rebound more effectively. The Plumlee brothers must be interchangeable. Although Mason is higher rated coming out of high school, Miles showed flashes of his talent this past season. They have similar builds and are both competent athletes. We can’t afford to lose steam when substituting one for the other. As a premiere program in college basketball, Duke’s goal each season is to win championships. This next season the ACC will be weaker than usual. Even with a depleted roster and a crop of unproven players, Duke can contend for another conference title. Indeed, the new-look Blue Devils will buck the trend of guard-led teams of the 2000s. Coach K enters his 30th season at the helm—he will have one of the most difficult coaching jobs since the mid-1990s. The development of the young players on this team will help determine our role in the national picture for the next four years. College basketball, like history, is cyclical. While next season may not promise a Final Four, Duke basketball is on its way back to the top.